I said Yes to this inspired vision and committed to bringing it into reality. Months later, I searched “shift from fear to love” online to see what else was out there. I landed on Lead with Love’s website. The Lead with Love Summit looked dreamy but living in North Carolina, it didn’t seem feasible to attend an event all the way out in Aspen. Yet weeks later, as I was working intuitively, I knew I had to purchase my plane ticket at that very moment. I have learned to trust these leaps of faith. Sensing it would work out logistically and financially - I bought my ticket to Aspen. As the weeks before Lead with Love unfolded, I applied for Lead with Love’s scholarship program – and was accepted. I then contacted my dear friend in Aspen who offered me her house and car because she was going to be out of town while I was there. Everything lined up in perfect order. Everything that happened at Lead with Love – the conversations, the workshops, the astrology reading, my walks in the mountains, and serendipitous encounters with other participants – all led me to feel in every cell of my body, by the end of the Summit, that I was one hundred percent committed to shifting our world from fear to love. I heard footsteps, it was Ajume Wingo, the Prince of Cameroon, running up the trail. I’ll always remember that pivotal moment. I returned home to Asheville with total conviction, commitment and courage to embrace my mission fully – that shifting from fear to love is the mission that underlies my business and my life. I was ready to take a stand for it. I am so grateful to Lead with Love for coming into my life at just the time I needed courage, conviction and clarity to lead the biggest vision I’ve ever said “yes” to. And now here I am, a few days from The Shift from Fear to Love Event. This inspired vision is landing live and on stage at Diana Wortham Theatre in the heart of downtown Asheville, NC on March 31st . I invite any and all – whether you live in Aspen or Asheville or anywhere in between - who are drawn to this mission of shifting from fear to love, personally and collectively. I invite anyone who wants to step into their next level of leadership inspired by love, higher power, and deeper purpose. I invite anyone who wants to deepen their courage, conviction, and commitment to bring their inspired vision into reality. We will be with you in this journey of moving beyond fear and stepping into your greater calling – just like Lead with Love was with me in stepping into mine. For in-depth details about The Shift from Fear to Love, visit www.ShiftFromFearToLove.com. Jessica Chilton is an Expressive Arts Therapist and Business Coach who has helped thousands of people around the world in discovering what they’re meant to do. 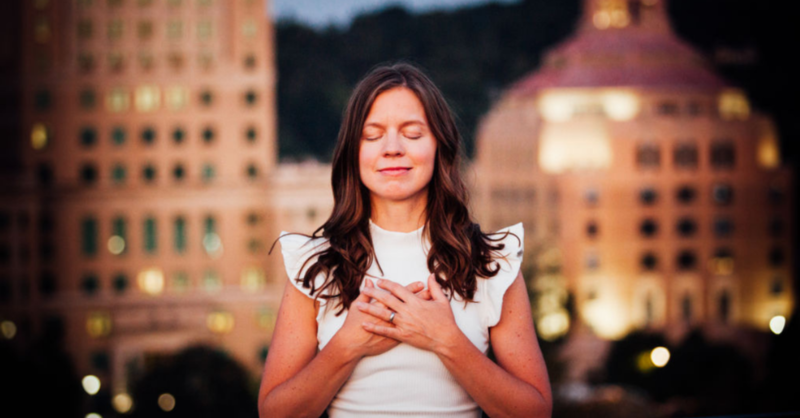 Through her signature program, Love Liberate Launch, Jessica blends business building with spiritual growth, personal transformation, and creative expression to help entrepreneurs create the business they were born to lead. Her newest program, Love Liberate Lead, is for the established entrepreneur who is ready for a pivotal year of exponential growth and leadership. Interested in receiving a scholarship to a 2019 Lead with Love event?